Time is the most important resource during the CAT exam. When it comes to making the students feel the time crunch, nothing beats the CAT reading comprehension passages. On the test day, you will see about 5-6 passages: either 3 short and 2 long passages or 2 short and 3 long passages. The ideal average time to spend on reading the passage and answering the questions is about 6 – 8 minutes. That means just to read the passage you have barely 3-4 minutes. Let’s admit it – CAT passages are tough. And, to comprehend them in such a short span of time can seem very intimidating. But, the good news is that with the right approach, these passages can be cracked in less than 3 minutes. So, how do you do it? Before we answer this question, let’s first discuss how an ordinary CAT student handles the RC passages. 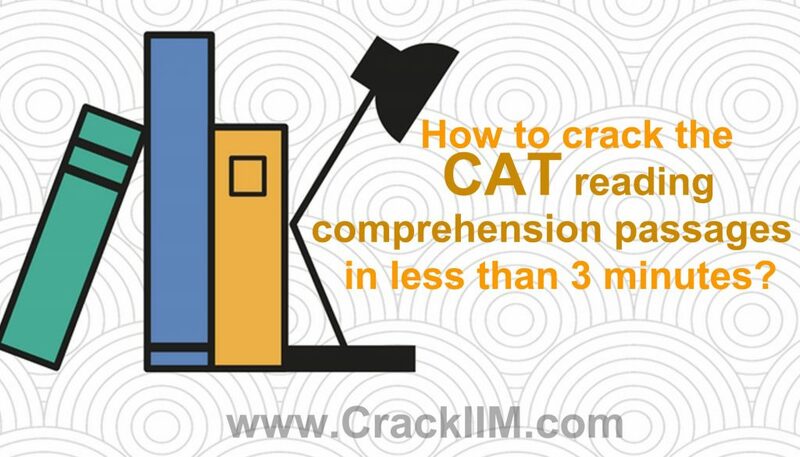 How does a smart student tackle a CAT passage? He or she focusses on the most important aspects of the passage that help him comprehend the passage and at the same time aid him in reading the passage quickly without getting lost in the minute, unimportant details. 1.What is the main idea of the passage? The main idea is nothing but the objective or the purpose of the passage. Why did the author write this passage? What is that one single idea that he wanted to convey through the passage? These questions are answered by the main idea. In terms of the hierarchy of important ideas within the passage, the main idea sits right at the top. The individual sentences and paragraphs contribute to developing and supporting this one central point. The main idea could be either explicitly stated or implied through the passage. When it is stated, it could be present anywhere in the passage but generally, you will find it at either the beginning or the end of the passage. When it is implicit, you need to derive the main idea by focussing on how the passage has been developed or organized. 2.What is the structure of the passage? Understanding the skeletal structure helps you in building the links between the sentences as well as paragraphs. By focussing on how the author presented his ideas, you no longer read the passage passively but understand the perspective of the author much more clearly. Moreover, knowing the structure helps you locate information quicker in the passage and save the time in skimming through the passage. What is the purpose of this specific paragraph? How does this connect with the previous paragraph? How did the author build the passage? Is he defining something? Comparing or contrasting an idea? Introducing a new idea? Etc. 3.What is the tone of the author? Tone indicates the attitude of the author towards the topic he is writing about. In simpler words, it is about how the author feels about the topic. The tone could be divided into 3 categories: positive, negative and neutral. Critical, sympathetic, objective, denigrating, cynical and motivating are some examples of author’s tones. of cracking these questions becomes easier. In order to find the tone, focus on the choice of words. For instance, both ‘slim’ and ‘skinny’ have similar meanings but vary greatly in terms of connotation. Specifically, pay close attention to adjectives and adverbs that the author uses throughout the passage. To summarize, not all ideas have equal importance on the CAT reading comprehension passages. If you want to build the skill of acing these passages within 3 minutes without sacrificing the comprehension, concentrate on identifying the main idea, structure, and tone of the author. Remember that CAT passages are not testing your memory but your comprehension. So, make sure you do not get lost in details. In all, staying focussed on the broad view is the mantra for success on the CAT reading comprehension questions.